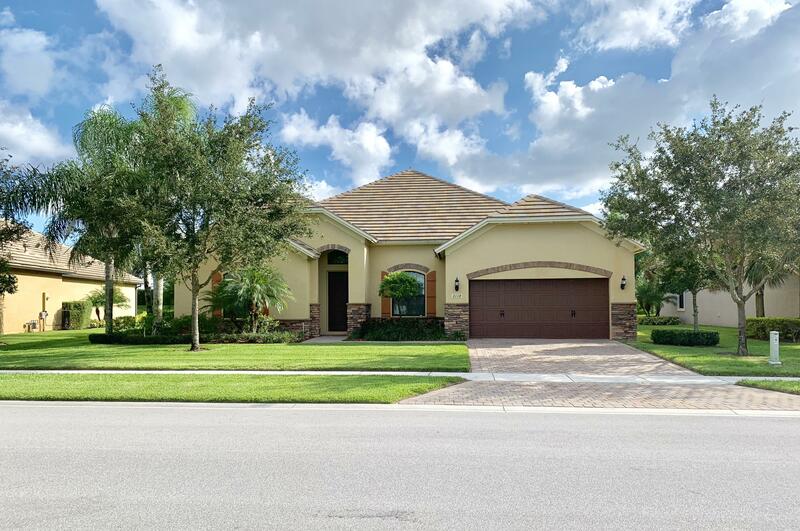 All CASTELLINA homes currently listed for sale in Wellington as of 04/19/2019 are shown below. You can change the search criteria at any time by pressing the 'Change Search' button below. "Absolutely beautiful Ritz model in Castellina featuring 4 spacious bedrooms, a large office/den, 3 1/2 bathrooms, 3 car garage and a gorgeous custom pool. This home has it all from incredible lake views to many upgrades thru-out the home. The amazing kitchen is a chef's dream featuring a large center island perfect for the entertaining, upgraded gas appliances, wood cabinetry, pendant lighting, and granite countertops. The outdoor living space is breathtaking with a custom salt water pool features LED lights, extended sundeck, waterfall, decorative fire bowls, & large spa. Coffered ceiling with custom wall design in family room area. Large formal dining area. Plantation shutters for all the windows and all are hurricane impact windows. Prime location in Wellington highly desired community"
"PARADISE AND TRANQUILITY in sought after Castellina featuring Resort Style Amenities. 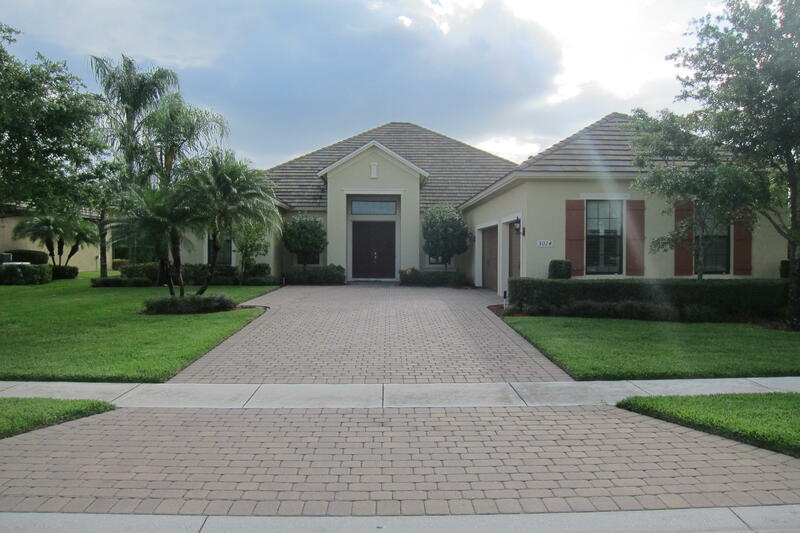 Over 3200 living area w/4 Beds, 3 full Baths (incl a Cabana Bath) & 3 car garage. 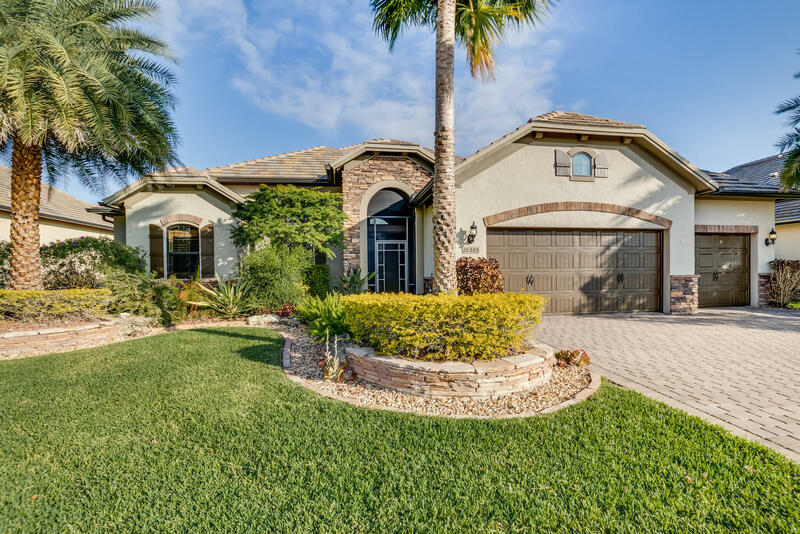 Paved Lanai overlooks a beautiful water view & features a screened in pool, thriving Koi pond, custom lighting & additional electronic screens for the designated patio. Extra rooms incl Den, Dining & oversized laundry. High ceilings & door ways, Impact doors&windows & manufactured wood flooring compliments all living areas. Granite counters in kitchen & all Baths. Home also features are Coffered ceiling w/custom design in Family Room. Open concept kitchen boasts Gas appliances, Pendant lighting & SS Appliances. Home has custom crown molding,wall pest control & Recessed lights. 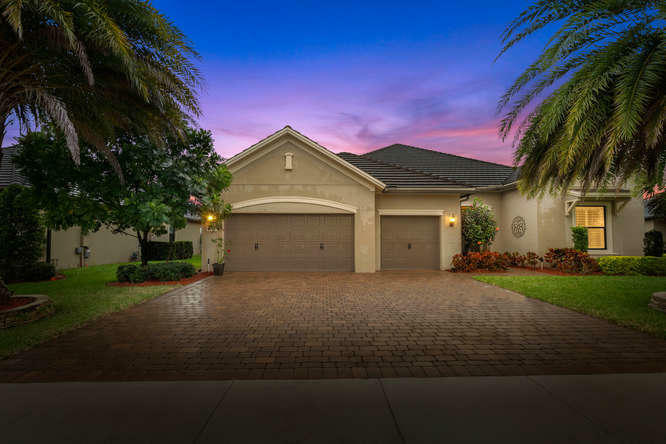 Home security system conveys>"
"ABSOLUTELY BEAUTIFUL HOME IN CASTELLINA ONE OF WELLINGTON'S MOST PRESTIGIOUS GATED COMMUNITIES. THIS PREMIER COMMUNITY IS STRATEGICALLY LOCATED WITHIN A SHORT DISTANCE OF EXCLUSIVE SHOPPING, RESTAURANTS, POLO, HOSPITAL & MUCH MORE! THE IMPRESSIVE JAMISON MODEL OFFERS BUYERS 4 BED 3 BATHS, FLEX ROOM, SPACIOUS & OPEN SPLIT FLOOR PLAN ALONG WITH EXTENSIVE UPGRADES THROUGHOUT THE ENTIRE HOME. SITUATED ON ONE OF THE LARGEST CORNER LOTS IN CASTELLINA. 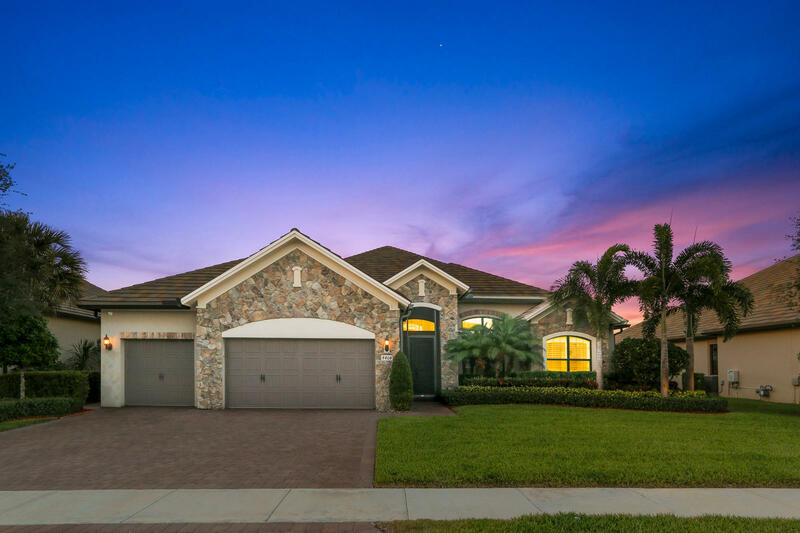 ENJOY SUNSET EVENINGS ON YOUR OVERSIZE SCREENED PATIO WITH RELAXING LAKE VIEWS OR HOST YOUR OUTDOOR SOIREE WITH PLENTY OF SPACE TO ROYALLY ENTERTAIN. COOKING IN THE FULLY APPOINTED CHEF'S KITCHEN IS A DELIGHT. SPACIOUS MASTER BED & BATH HAS CUSTOM WALK IN CLOSET & A MASTER BATH THAT OOZES RELAXATION WITH A ROMAN TUB & LARGE SHOWER. WELCOME HOME!" "The Wellington home you have been waiting for! 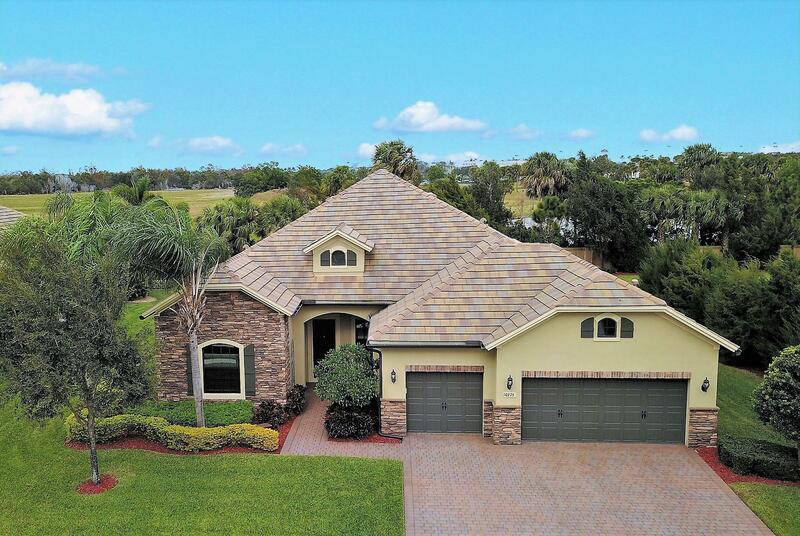 Exceptional 2,561 SF/AC houses 3 bedroom + office and 3 full baths. Situated on an upgraded lot, this fabulous property offers an exceptionally broad LAKE LISBET view & superb landscape for your solace and enjoyment. Interior upgrades abound! The highly upgraded kitchen features espresso brown 42'' maple cabinets with 2.25 inch crown molding. Deluxe Kitchen Aid stainless steel fridge, gas range, oven, micro & dishwasher compliment the elegant granite counters, island breakfast bar & sink. A rich platform of natural wood brown flooring graces the living area of the home. 8 foot doors compliment volume ceilings. Coffer & crown molding in the great room plus high end luxury lighting. Experience this property in your search for a quality home!" "This unbelievable location offers privacy and serenity within a comfortable walking distance to Trader Joe's, Starbucks, and Whole Foods Market. 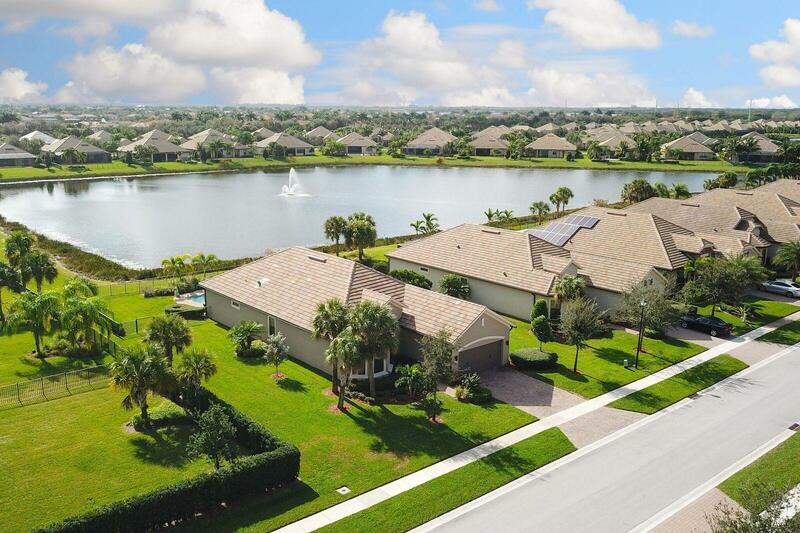 Located on a prime cul de sac location and boasting a .44 acre lot, this Dartmouth model home is one of the most private and peaceful homes in Castellina. Its location is ideally situated directly across from a private park which is perfect for dog walkers, families, or the exercise buff who enjoys a walk from the front door through the park to the clubhouse gym. Upon entry to this full impact window residence, you will experience the panoramic view from front door to restful backyard complete with private pool. 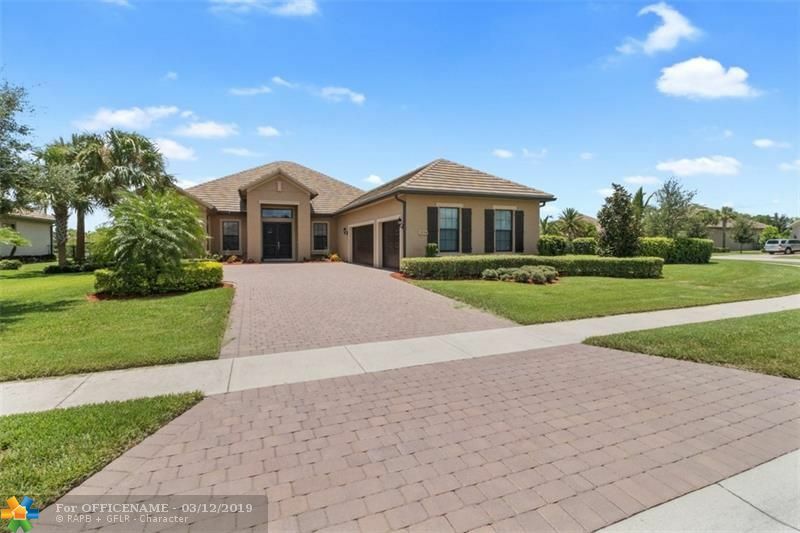 Follow the easy to maintain, upgraded 17x17 modern ceramic tile flooring through to the great room where you embrace grand volume"
"Beautifully Appointed Dartmouth Model being offered fully furnished in the gated community of Castellina. This home offers many upgrades and is move in ready. Offering 3 bedrooms, 3 bathrooms plus Office/Den (optional 4th bdrm), 3 Car Garage and Screened in Lanai. Expansive backyard allows plenty of room for a Pool, Outdoor Kitchen, etc. Expansive Kitchen open to Great Room has plenty of counter/prep space, upgraded cabinetry, Granite Countertops along with a Snack Bar and Gas Cooktop. Master Suite is large with plenty of space for a sitting area, plantation shutters adorn windows and Custom ceilings add that extra detail to finish it off. Large Master Bathroom with Seamless Shower Door, Rain shower Head and Separate Tub. Large walk in closet with built in's to accommodate all of"
"SHOWS LIKE NEW* Luxury living, exceptional location, convenience and security! Castellina is the newest upscale boutique housing community in cosmopolitan Wellington. This beautiful Rainer model offers a spacious open floor plan ideal for entertaining, full impact windows and a 2 car garage. The spacious split floor plan has 2,459 sf of air-conditioned living space, includeing 3 bedrooms, 2 full baths, and a den/office so there's plenty of space for family & friends. 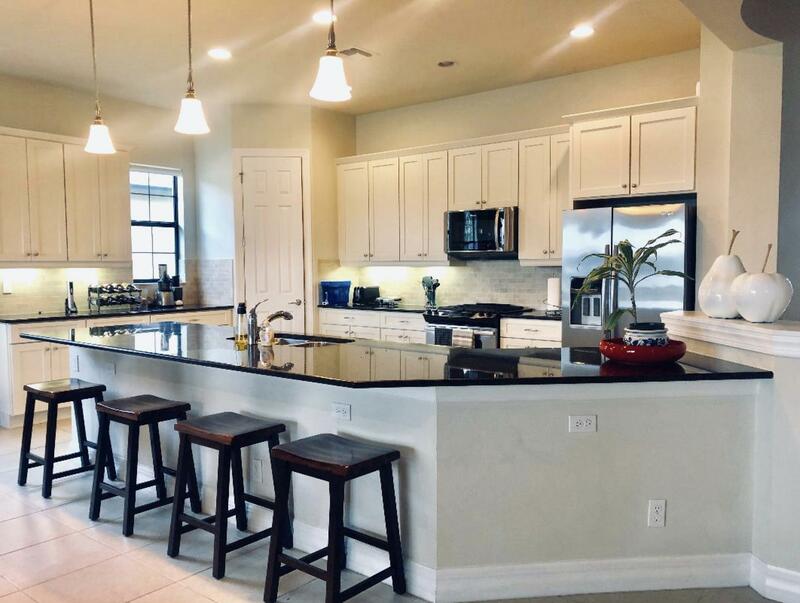 At the heart of the home is an impressive, well equipped kitchen complete with a natural gas range, premium Kitchen Aid stainless steel appliances, granite counters, and travertine backsplash. 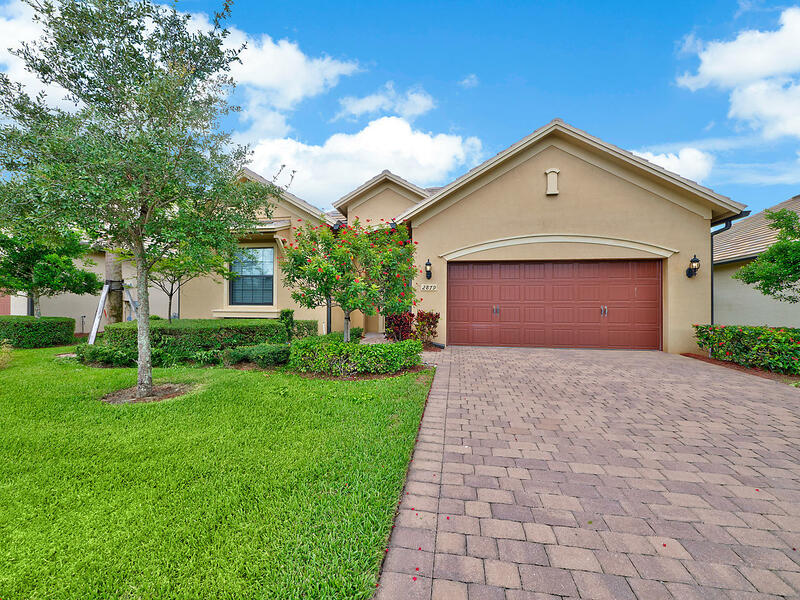 (SEE MORE)"
"Amazing Estate home located in private wellington gated community called Castellina. 4 bedrooms 3 full baths, build in 2013, located on .33 acre lot. Gourmet kitchen with upgraded cabinets and granite counters, stainless steel appliances. great location near the Wellington Green Mall. Offers resort style amenities, Olympic pool, tennis courts and club house. Full weight room. This is the Jamison model with an open floor plan over 3,200 sq ft of living are,"
"BEST OPPORTUNITY CASTELLINA HAS TO OFFER!! 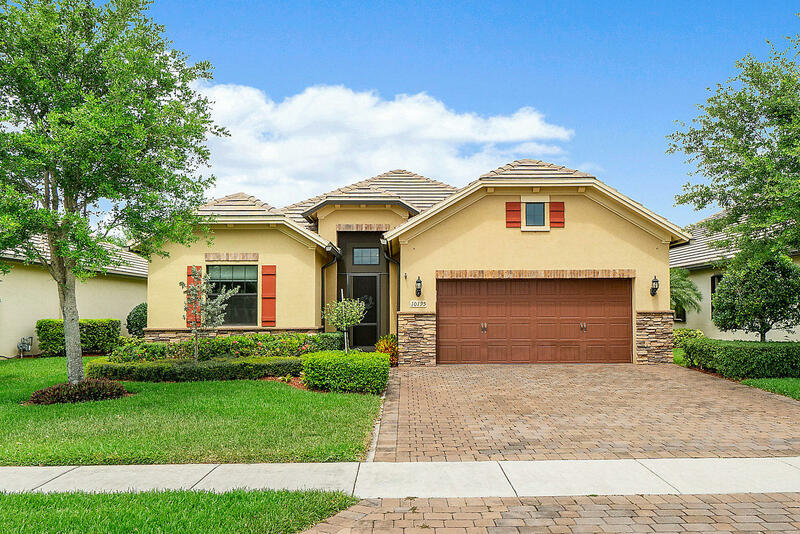 !Located in one of the newest and most desirable communities in Wellington, this beautiful Cranford model by Divosta offers a spacious open floor plan great for entertaining, full impact windows and a 3 car garage. Conversation and company flow freely from the kitchen and living areas to the covered patio overlooking the large backyard.Open to the living room, the beautiful kitchen features stainless steel appliances, a gas range and a large breakfast bar. The house consists of 3 bedrooms and 2 and a half bathrooms, den/office and a bonus room which can be either a 4th bedroom, playroom, or even a workout room. The spacious master bedroom features a walk-in closet and a beautiful bathroom where you can relax with with dual vanities,"
"Beautiful Reiner Home with wonderful lakeview. This is a best seller!!!. 3 bedrooms 2 full baths additionally offers an office/den that takes as a 4 bedroom place easily, and expansive 2 car garage. Impact windows and doors are throughout the home. Interior flooring is tile, Fully upgraded builder kitchen package with stainless steel appliances, gas cook top and oven .Granite kitchen counter tops & backsplash compliment the high-end constructed wood cabinetry and social area that oversees at the lake. Large patio is perfect for entertaining and dining with great lake views. 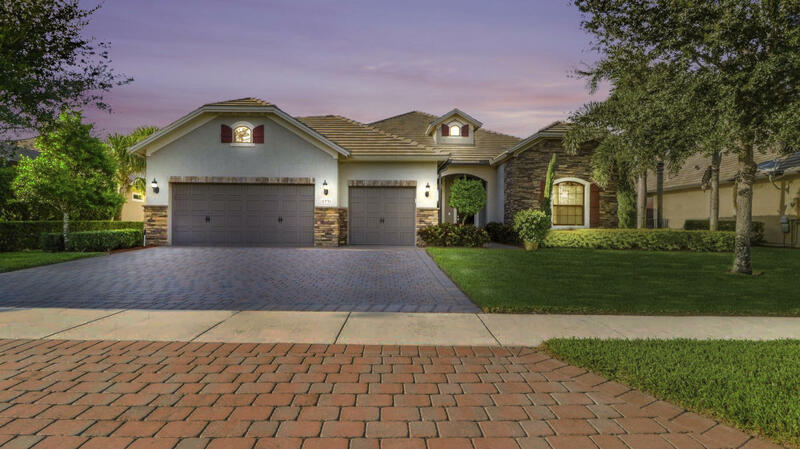 Castellina is one of the newest neighborhoods in Wellington"
"Perfect single story home in highly sought after Resort Style Community of Castellina. Newer construction (2013) 3 Large Bedrooms, 2 Baths, 2 Car Garage, Upgraded Kitchen, SS Appliances, Granite, Tile in Main living areas, full Laundry room with Laundry Tub, Covered Patio for grilling or relaxing with the serene Lake View. Large back yard with plenty of room for pool. Pet friendly community with all the amenities: Enjoy the pool, have a picnic in the Park Pavilion, Lounge by the Fire Pit, Work out in the Exercise Room, Play Tennis, or visit shoppes and restaurants nearby. Great Schools"
"GORGEOUS! This 3 bed 2 bath home has all IMPACT WINDOWS & DOORS, hardwood flooring and upgrades galore! Beautiful landscaping contrasting with the renaissance style wood/stone combination makes you feel like in a different era! Come inside and experience the modern layout remarking the different spaces but still very open! Tile in diamond shape throughout the living areas and Kitchen which is to dream of, granite countertops, stainless steel appliances, gas range and 42'' wood cabinets and bar stool seating! Tall ceilings with recessed lightning makes the house feel open and spacious! The Master bedroom features wood floors and recessed lights as well, the master bath has separate tile framed tub and shower with glass doors and double sinks with lots of cabinets."